You don’t have to accept limited mobility; our bionic knee braces can help you stroll comfortably into your next adventure. 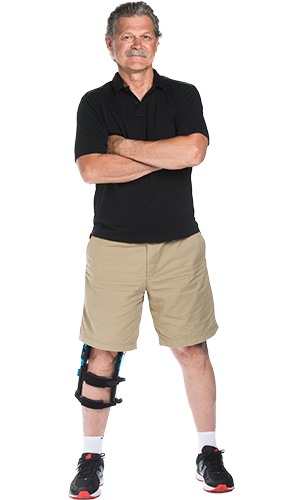 The Levitation®2 knee brace is the world’s first bionic knee brace offering directly enhanced mobility. Levitation helps you crouch, stand, navigate stairs, or simply go for a walk. With Levitation , you can live life your way. How Long has it been Since You Jumped? Crawled? Climbed? Played? Maintaining your mobility is essential for everyday life. Think of how far you walk in a day: from room to room in your home, up and down the stairs, your duties at work, down the street to the post office… thousands of steps every day. And when osteoarthritis or a knee injury catches you, it’s easy to find excuses to avoid the unnecessary trips — then the more important trips. When you lose your basic ability to move, you lose your freedom. The Levitation knee brace can lift a significant portion of your body weight. It encourages mobility and helps you increase your activity levels. The result is a product that helps you maintain or increase your leg muscle strength. This customizable assist means there’s less friction between your femur and patella in your knee joint — and less friction means less pain and wear and tear. The Levitation knee brace can help you crouch, walk, and climb stairs with greater ease and less pain.